The company’s latest project is called “10453: A Story About Life in 1 km2 of Trash.” Kindly, writer/director Camille Brunel Aoun and Producer Denise Maroney agreed to answer a few questions for everydaytrash.com. everydaytrash: What is “10453: A Story About Life in 1 km2 of Trash”? How did the project come about? The (B)IM Project: 10453 is a theatrical performance that combine dance, mime, clown, text and images related to the nightmare of our everyday life surrounded by trash. The play is a journey through the life and habits of 5 characters who deal with garbage, both consciously and unconsciously. The play offers metaphors for the absurdity of a society that ignores the dirt it is breathing in every day and the danger it is creating for itself. The project began in 2011, when producer Denise Maroney was awarded a grant from the Theatre Communications Group to workshop a theatrical production in Lebanon, pertaining to the Mediterranean Sea. During this period, Maroney spent time examining topics related to Lebanon’s Mediterranean coast. The abundance of trash found on beaches and in the sea struck a chord. 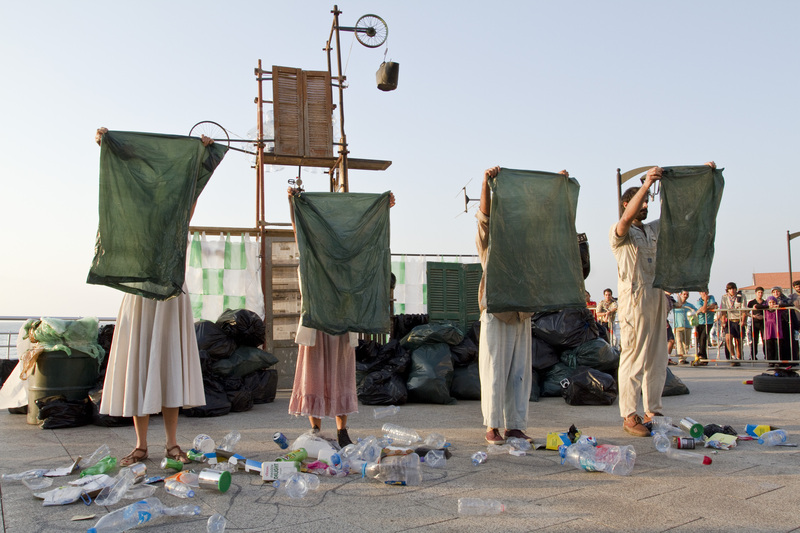 With director/writer Camille Brunel Aoun, the two began imagining a performance that would spotlight trash and question human behavior relating to waste. everydaytrash: Where will the tour take the performance? 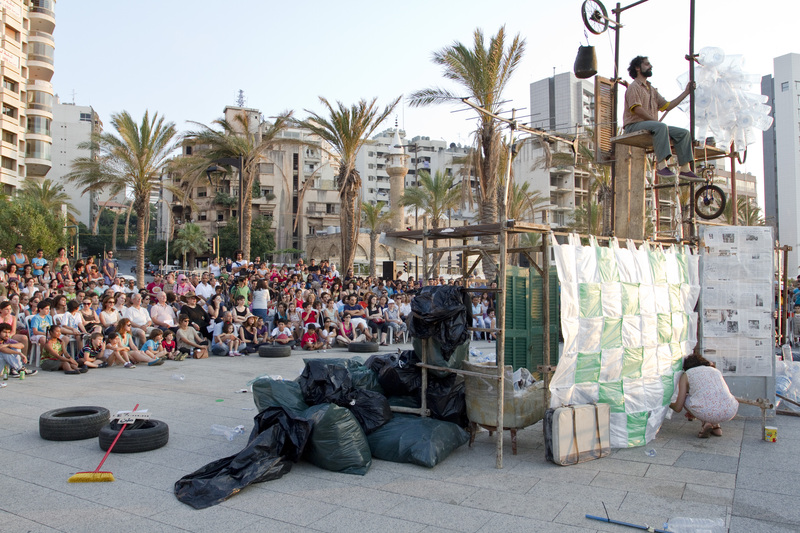 (B)IM: We began with performances on the boardwalks of major cities in Lebanon- Tyre, Sidon and Beirut. The boardwalks offered an appropriate location: a public, accessible place where land and sea meet. The backdrop of the sea provided a stunning effect and resonated within the story. We are currently preparing to present this play in various festivals across Lebanon during Ramadan. In the fall, we hope to perform in schools and indoor theatres across Lebanon. And of course, we will be looking for opportunities to take this play into international theatre festivals! everydaytrash: Several of your past performances have incorporated trash and recycled material, what do you see as the connections between theater and waste? Are there particular connections for Lebanese or more generally Middle Eastern societies? 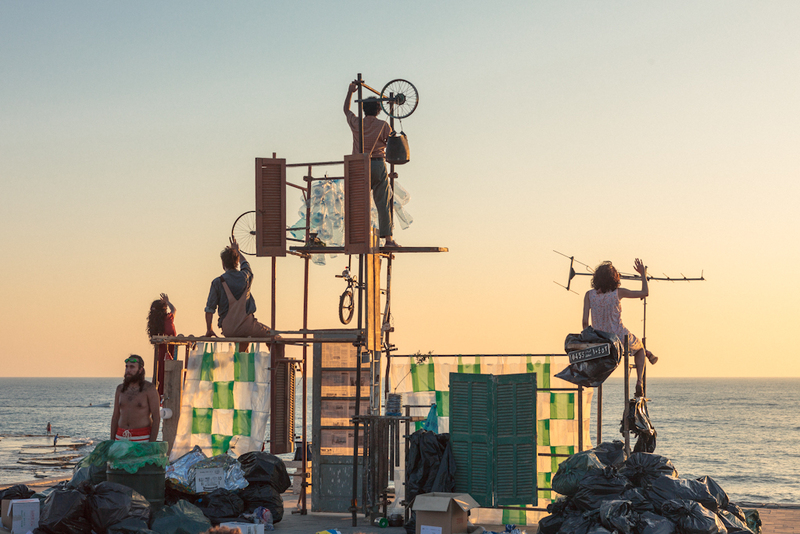 Theater offers a space to re-imagine ‘waste.’ Lebanon, in particular, is a country surrounded by waste, namely rubble from post war de/re-construction and heaps of abandoned trash. By animating discarded material from the society we are living in, we are opening up imaginations and inviting our audience to creatively examine their environmental space. One can also approach the relationship between theater and waste through the lens of legendary Polish director, Jerzy Grotowsky, and his ideas of a poor theatre: “Theatre must recognize its proper limitations. If the stage cannot be richer than cinema, let it then be poor. If it cannot be as lavish as television, let it be ascetic.” Thus, we use what surrounds us to create theatre. At the end of the day, you can create for a very low cost. It’s a positive and magical act to create “something” from very little. everydaytrash: What’s next for The (B)IM Project? (B)IM: We’re going to live with this play for a while… performing in different venues across Lebanon. Eventually, we want to perform it beyond Lebanon’s borders. Whether we tour in neighboring Middle Eastern countries, or beyond, 10453 is a play relevant to all citizens on this Earth.